Think of a fence as the frame around the perfect picture that is your home. But different frames provide different benefits, and different looks! Here are some types of residential fencing to consider when making the decision to frame your home. Privacy fencing is a great way to keep your kids and pets in the yard, and your nosy neighbors out. Traditional privacy fences are between four and six feet tall, and installed in tight-fitting panels. Wood privacy fences can be stained or painted to match the surroundings, and vinyl fencing is low maintenance and comes in a variety of styles. If you’re looking for a classic option for residential fencing, take a look at a picket fence. Traditionally made of wood, picket fencing is distinguished by its evenly spaced vertical boards, called pickets, which are attached to horizontal rails. Today, they are available in wood and PVC vinyl in a range of colors. Wood fencing provides a natural and rustic look to complement your home. Wood is lightweight, commonly available, and can be easily shaped to give your home character and individuality. Common styles include split-rail, paddock, picket, and estate-style fencing. Chain link fencing is the workhorse of the fence industry. While a chain link fence does not provide much privacy, they do perform all other functions of a fence admirably. Homeowners who are looking for an inexpensive, durable, and low-maintenance residential fencing option are advised to look here. You can go with the traditional galvanized chain link or add a vinyl coating for scratch-resistant fencing. 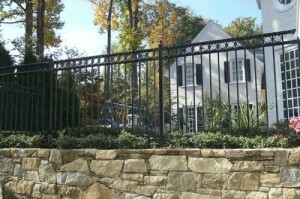 Ornamental steel fences give a house a classy, stylish look. The modern-day evolution of the wrought iron fences, high-quality fences will be have a specially applied powder coating to create a durable and long lasting finish. Ornamental steel comes in an abundance of styles and colors. This entry was posted on Thursday, August 27th, 2015 at 2:04 pm. Both comments and pings are currently closed.